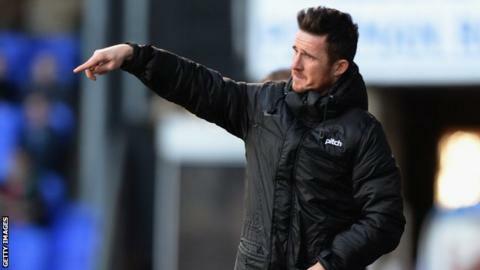 Former captain Barry Ferguson says it is his "ultimate dream" to return to Rangers as manager. The 35-year is currently caretaker player-boss at Blackpool. "I did everything I wanted to in terms of playing for Rangers, captaining Rangers and picking up trophies," he told BBC Scotland. "Of course, I need to learn my trade first, but I'd be lying if said it wasn't my ultimate dream to go back one day as manager." Rangers will be in Scotland's second tier next season, having completed back-to-back promotions, and the club are unbeaten in League One. Manager Ally McCoist has, however, come in for some criticism following a surprise Ramsdens Cup final loss to Raith Rovers and several less than convincing performances against part-time opposition. All of this has played out against a backdrop of turmoil at board level, with fans currently threatening to withhold season ticket money over concerns about the financial management at the club. "Ally has got a difficult job," said Ferguson. "The goal is to get through the divisions - he's done that the last two years. "All right they had a difficult time against Raith Rovers but that happens in football, It was a bad day at the office. "I know how difficult it must be for him. The club should be at the top challenging Celtic every season. "I just hope that sooner rather than later they get it all sorted out because Scotland needs a Rangers at the top." Ferguson stepped into his first managerial role following the sacking of Paul Ince in January and Blackpool sit 20th in the league, two points above relegation zone. "My only concern is keeping this club in the Championship, then we'll take it from there," he said. "It's a difficult task but it's not one I'll shy away from. "I know there are people out there that want me to fall flat on my face and that makes me more determined. "I grew up with that at Rangers. Half of the country loved you and the other half hated you." Ferguson's career at Rangers ended under a cloud when he was stripped of the captaincy in April 2009, following misconduct while on Scotland duty. He left for Birmingham at the end of the season and declined a later approach to add to his 45 international caps. "I've made many mistakes in my career," he admits. "Probably the Scotland scenario tops it all. "If I could turn back the clock on one thing, I'd have done that a lot different. But it happened and I suffered the consequences. "People can say what they want but playing for your country and captaining your country meant a lot to me."